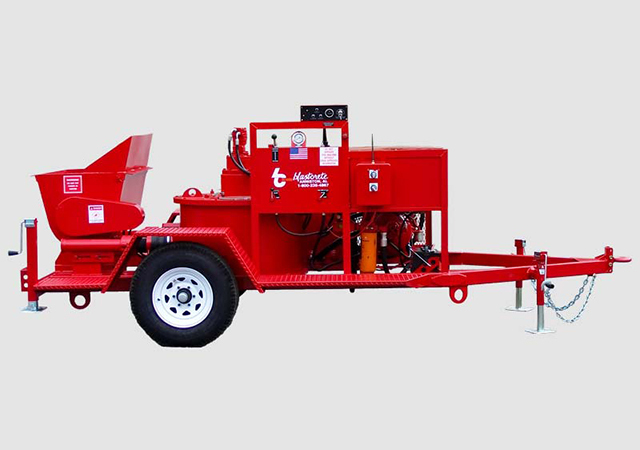 The Blastcrete Model RD6536 Pump is our concrete pump with variable speed from 0-25 cubic yards per hour. This pump is designed to pump up to 3/4 inch aggregate concrete, concrete block fill (grout), shotcrete, floor leveling cement, mud jacking, and cellular concrete. The machine is powered by a 29 HP Kubota water cooled diesel and is equipped with our 1000 lb. capacity receiving hopper with hydraulic agitator. The unit is mounted on a single axle high speed towing trailer with electric brakes and electric braking lights. Gross Weight — 3900 lbs. Fuel Tank — 10 ga.